Google Classroom has come a long way since it was first released. In my first year of teaching, I used Edmodo, but I was one of my district's early adopters of Classroom the following year when it debuted. In my opinion, Classroom has been superior to Edmodo in every way except for one. I couldn't assign to individual students or small groups, which was one feature that I extremely enjoyed about Edmodo. If I wanted my students collaborating in a small group on Classroom, I would have to post an assignment with one Doc for each group and project a list of who was in what group. The whole class would have edit access to each group's Doc, which led to some problems (and also lessons on digital citizenship). We've all been there; 25+ fourth graders on on shared Doc is just asking for trouble. Asking students to share Docs to each other is manageable in some cases when the usernames make sense, but some districts use a string of letters and numbers for each kid. Simply put, small group collaboration wasn't the easiest or most intuitive thing to do natively through Google Classroom. 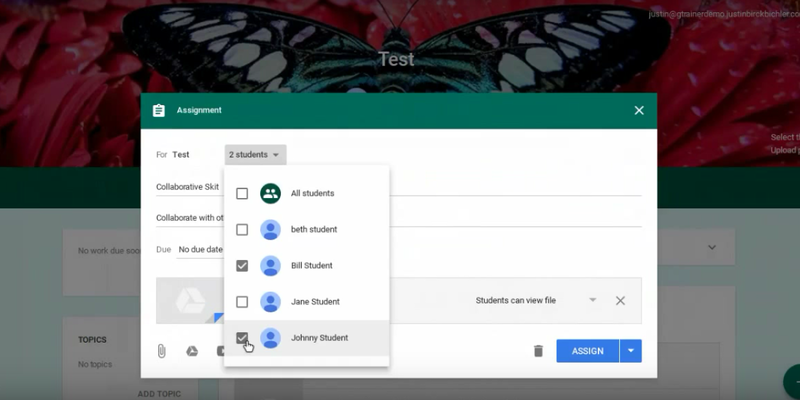 As part of a onslaught of features released in a new GSuite update, teachers can now assign assignments to individual students. This makes individualizing work much easier, but I began thinking. It's being touted as a differentiation method, but I see power in it as a collaboration tool. Could this be the solution to my "small group collaboration" struggles? If you're good at reading blog titles, you already know the answer. After tinkering around with the new "Assign to Individual Students" feature, I found that you could assign one Doc (or Sheet or Slides or whatever) to a group of students (let's call them Ben, Brett, John, and Josh) and set that file to "Students can edit." Ben, Brett, John, and Josh can now collaborate on that Doc, without anyone else being able to access their work. Ryan can't get on accidentally (or purposefully) to delete or modify their work, nor does Ryan even know it's been assigned to the gentlemen. Each student only sees their own work, and doesn't explicitly know who else got the same assignment, unless they are collaborating together. The instructional implications of this are boundless. My students often write scripts for mini-skits together, and now each group can have their own meeting place. Do your students do collaborative research? They can work together without other groups disrupting them. Co-authoring a short story would be a breeze, and would making a presentation with a small group. Making collaborative math Slides would be as easy as pressing Assign. Think about how you want students collaborating in small groups - this can be a powerful tool to make that happen. Below I've included a video tutorial of how to do this and also written out directions. 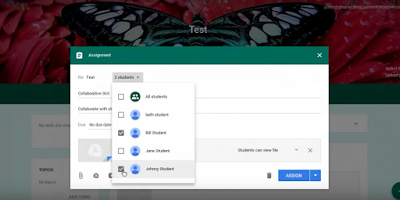 Make a new Assignment in Google Classroom, just like you would for any other assignment. Title it, write a description, add a due date, etc. Attach a Drive file (Doc/Sheets/Slides/etc). Just above the title, choose the drop down menu that says "All Students." Uncheck "All Students." Select the students you want to receive this file. Change file permissions to "Students can edit." Press Assign. Your work here is done. Allow the students to take charge. How can you see this being used in your classroom?